Casio’s G-Shock lineup has made a name for itself by standing up to abuse. In this video tour of the company’s R&D center in western Tokyo, we’ll see just how much abuse this rugged brand of watch can take. 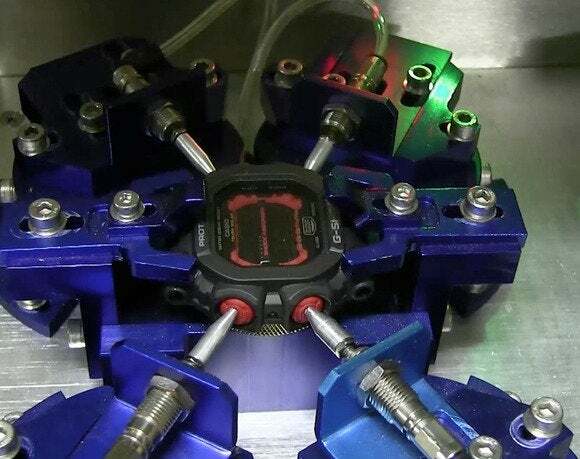 The testing the G-Shock watches go through in this video report include a drop test onto a block of concrete, a spin in a centrifuge, and a dunk in a device that simulates underwater pressure. And if they still keep ticking, there’s always a hammer test. This device pushes the buttons on a Casio G-Shock tens of thousands of times to stress-test the watch. Casio has been putting out G-Shock watches for three decades, recently showing its concept designs at the Baselworld trade show in Switzerland. For extreme accuracy, the GPS Hybrid Waveceptor automatically checks its time against land-based radio signals as well as GPS satellite signals. The G-Shock Gulfmaster, meanwhile, has an atmospheric pressure sensor to help predict weather changes, as well as a compass and a tide indicator. Casio has also produced a G-Shock that can link to your smartphone via Bluetooth. And the G-Mix can control a phone’s music player and adjust the volume with a turn of the rotary switch. But don’t expect Casio to enter the smartwatch fray. The company says it has no plans for such a device, keeping its focus on timepieces, not computers.